After learning and going through the ALMOND, Let's move on to the next nut : CASHEW NUTS !!! Cashews are believed to have originated in the northeast of Brazil, near the Equator. It is likely that Spanish sailors first introduced the cashew to Central America in the sixteenth century. 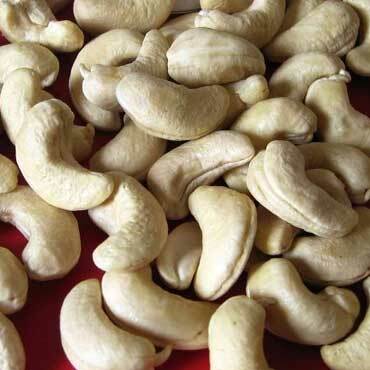 Later, Portuguese colonists brought cashews to territories in East Africa (Mozambique) and India (Goa), where its cultivation extended to Indonesia and the Philippines. 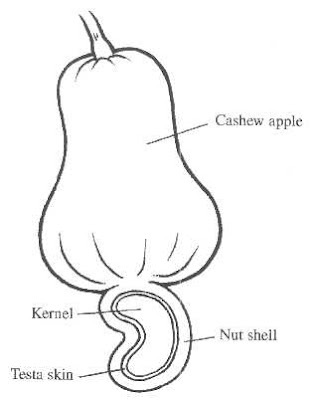 The cashew fruit consists of two distinct parts: a fleshy stalk in the form of a pear - also called the cashew apple - with a brilliant yellow or red skin that can measure from 5 to 10 cm; and a gray-brown colored nut (the cashew) in the shape of a kidney, which hangs from the lower end of the stalk or "apple." The cashew is a tree in the family Anacardiaceae. Its English name derives from the Portuguese name for the fruit of the cashew tree, caju, which in turn derives from the indigenous Tupi name, acajú. Originally native to northern South America, it is now widely grown in tropical climates for its cashew seeds and cashew apples. Cashew nuts, a richly sweet product of the cashew tree, have gained popularity in North America and Europe not only for their succulent flavor but for health benefits, too. Whether roasted, salted, sugared or covered in chocolate, the cashew nut, often used as a flavorful complement to appetizers, main dishes and deserts, packs a mix of nutrients and minerals not found in many common foods. Cashew nuts, native to equatorial South America, are actually seeds, found growing on the end of the cashew apple, an edible and nutrient rich South American treat that is too fragile to export to North America or Europe . Also known by the botanical name Anacardium occidentale, the cashew is a close relative of mangos, pistachios, poison ivy and poison oak. It was first introduced on a worldwide scale by Portuguese explorers in South America in the 16th century, but international trade didn’t take off until the 1920s. Sometimes called “nature’s vitamin pill,” cashew nuts, which now rank #1 among nut crops in the world with 4.1 billion pounds produced in 2002, have been used to promote wellness for centuries. Botanically, cashew is an average size evergreen tree belonging to the Anacardiaceaefamily of the genus: Anacardium. The cashew tree is native to Brazil’s Amazon rain forest, which spread all over the world by Portuguese explorers. 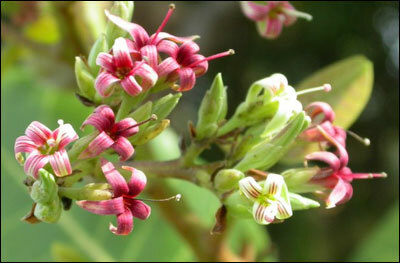 Today, it is grown commercially in Brazil, Vietnam, and India and in many African countries. 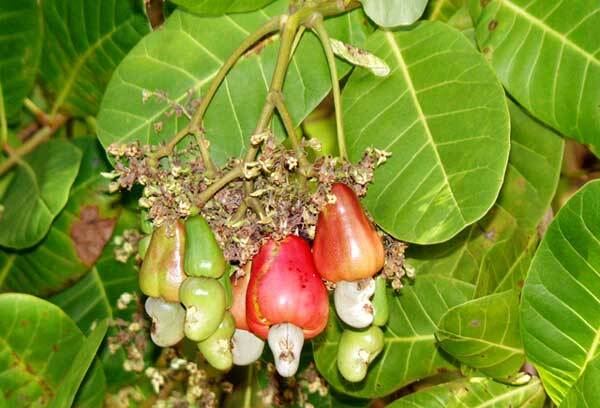 Cashew tree bears numerous, edible, pear shaped false fruits or “accessory fruits” called "cashew apples." A small bean shaped, grey color “true fruit” is firmly adhering to lower end of these apples appearing like a clapper in the bell. This true fruit is actually a drupe, featuring hard outer shell enclosing a single edible seed or the “cashew nut.” The outer shell contains a phenolic resin, urushiol, which is a potent caustic skin irritant toxin. It is, therefore, the outer shell is roasted in the processing unit in order to destroy the resin, urushiol and then, the edible nut is extracted. 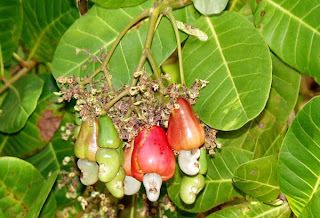 Cashew Nuts are found at the bottom of a Cashew tree. 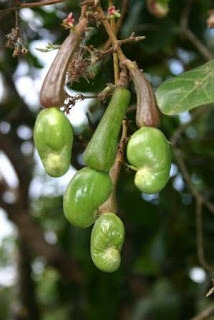 The Cashew nuts is actually hidden at the bottom of a fruit that also grows on that tree and the fruit is known as Caju. The caju fruit is also known as the cashew apple. This fruit is pear shaped and is either the color of yellow or red. The tree is native to the coast lines of the north eastern area of Brazil and dates back as far as the sixteenth century when some Portuguese explores introduced cashew nuts into India and some African countries. Today, the leading producers of cashews are India, Tanzania, Mozambique, Nigeria, and Brazil. The cashew nuts itself is kidney shaped and has a delicate flavor. Putting the cashew nuts into a food processor and processing them into small slivers that can be used on top of salads, pastas, soups, stews, desserts, and some fried dishes. Cashews contain more iron per gram than lean rump steak. And if you want to increase the absorption rate of iron, eat them with a glass of orange juice, as the vitamin C in the juice significantly improves its absorption. They also provide lots of zinc and potassium. Cashew nuts have a lower fat content and a higher protein and carbohydrate content than other types of nuts. The fat that they do contain is mostly (65%) derived from oleic acid, a monounsaturated oil with known benefits in protecting against heart disease and cancer. 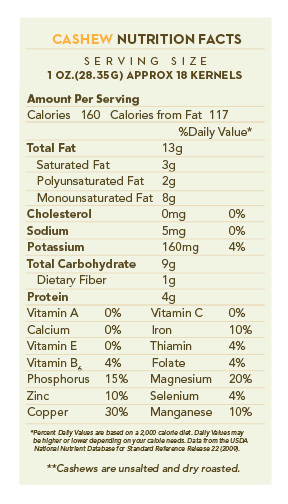 § Cashews are high in calories. 100 g of nuts provide 553 calories. They are packed with soluble dietary fiber, vitamins, minerals and numerous health-promoting phyto-chemicals that help protect from diseases and cancers. § They are rich in “heart-friendly”monounsaturated fatty acids like oleic and palmitoleic acids that help to lower or bad LDL cholesterol and increase good HDL cholesterol. Research studies suggest that Mediterranean diet, which is rich in monounsaturated fatty acids helps to prevent coronary artery disease and strokes by favoring healthy blood lipid profile. § Cashew nuts are very rich source of minerals. Minerals especially manganese, potassium, copper, iron, magnesium, zinc and selenium are concentrated in the nuts. A handful of cashew nuts a day in the diet would provide enough of these minerals and prevent deficiency diseases. Selenium is an important micronutrient, which functions as co-factor for antioxidant enzymes such as Glutathione peroxidases, one of the most powerful antioxidant in the body. Copper is a cofactor for many vital enzymes, including cytochrome c-oxidase and superoxide dismutase (other minerals function as co-factors for this enzyme are manganese and zinc). Zinc is a co-factor in many enzymes that regulate growth and development, sperm generation, digestion and nucleic acid synthesis. 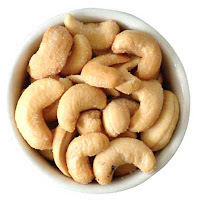 § Cashews are also rich in many essential vitamins such as pantothenic acid (vitamin B5), pyridoxine (vitamin B-6), riboflavin, and thiamin (vitamin B-1). These vitamins are essential in the sense that our body requires them from external sources to replenish and essential for metabolism of protein, fat, and carbohydrates at cellular levels. § In addition, the nuts are also containing small amount of Zea-xanthin, an important flavonoid antioxidant, which selectively absorbed into the retinal macula lutea in the eyes. It is thought to provide antioxidant and protective UV ray filtering functions and helps prevent age related macular degeneration (ARMD) in the elderly. Cashew nuts do have a relatively high fat content (12 grams per ounce, 2 grams saturated fat), but it is considered “good fat.” This is due to the agreeable fat ratio in the nut, 1:2:1 for saturated, monounsaturated, and polyunsaturated, respectively, which scientists say is the ideal ratio for optimal health. Even with the relatively high fat content, cashew nuts are considered to be a “low-fat” nut. In fact, cashew nuts contain less fat per serving than many other popular nuts commonly found in grocery stores and health food stores, including almonds, walnuts, peanuts and pecans. The cashew nut’s high magnesium content also takes the credit for its healthy heart qualities. In their raw form, cashews contain 82.5 milligrams of magnesium per ounce, or 21 percent of the daily recommended value of the heart healthy mineral, which also protects against high blood pressure, muscle spasms, migraine headaches, tension, soreness and fatigue.Magnesium also works with calcium to support healthy muscles and bones in the human body. Recent clinical trials have shows that cashews and other nuts work with a person’s lipid profile to have a beneficial effect on those with diabetes or at risk for diabetes. And with 37.7 percent of the daily recommended value of monounsaturated fats, cashews can reduce triglyceride levels in diabetics, protecting them from further complications. Integrating frequent nut consumption into your diet, especially raw cashews, may lower the risk of developing Type 2 Diabetes, the most commonly diagnosed form of diabetes in America today. All nuts, including the cashew nut, have been associated with a reduced risk of gallstone disease. According to the Nurses’ Health Study, looking at the dietary data of 80,718 women, integrating at least one ounce of nuts a week, such as cashews, gives women a 25 percent lower risk of developing gallstones. Research has also shown that chemicals in cashew nuts kill gram positive bacteria, a pervasive mouth affliction that causes tooth decay, acne, tuberculosis and leprosy. Eating cashew nuts at moderate levels, some say, can eliminate abscessed teeth, though this has not been proven yet by proper clinical trials. Cashew nuts are rich in zinc,copper, potassium and magnesium. They are also a source of vitamin K,vitamin E and vitamin B6.Therefore cashews are good for developing healthy bones. Cashew nuts are empowered with high fat content(monounsaturated fat) which reduce the bad (LDL) cholesterol level and increase the good (HDL) level.And thus it helps to maintain the heart health protecting against heart diseases and strokes. Cashew nuts are best nutritional snacks to boost up our energy levels and it also helps to keep our stomach silent. Cashew nuts are considered as brain food as it plays a main role in brain development. Especially to build intelligent and sharp brain, cashews must be included for kids in their diet. Cashew nuts contains high amount of dietary fiber which helps in weight management when consumed in moderation. Antioxidants in cashews helps to reduce the risk of cancer, diabetes and gallstones. It also helps to protect against tooth decay, acne, tuberculosis. Cashew is high in calcium and magnesium. Magnesium helps the body in many ways and here is just a few examples: Magnesium helps by giving physical structure to the bones and the bones store some of the extra magnesium on the surface of the bones, so that it can used whenever the bones need it, helps by regulate the tone of the nerves and muscle, and is a natural calcium channel blocker. A natural calcium channel blocker prevents extra calcium from entering into the nerve cells and activates the nerves. Another words, a calcium channel blocker helps the nerves relax. Although, lack of daily amounts of calcium can lead to many different problems such as muscle spasms, migraine headaches, and high blood pressure, eating a few serving of cashew a week can solve this problem. The nuts also help to prevent muscle tension, soreness in the body, and fatigue. 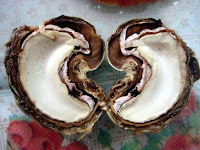 The nuts are also rich in copper which helps in the removal of certain harmful free radicals in the body, aids in the utilization of iron, help in the production of skin and hair pigment, and proper development of bones and the connective tissues. Copper also help with the bodies energy and acts as an antioxidant defense and helps in the flexibility of blood vessels, joints, and bones. This mineral also helps to prevent brain disturbance, osteoporosis, iron deficiency, anemia, rheumatoid arthritis, and irregular heartbeat. Cashews were linked to people gaining weight, but in new studies that was proving to be untrue. People who eat cashews twice a week are less likely to gain weight as compare to the one who never have eaten cashews in their life. Cashews are found to be a good source of Vitamin K which prevents blood coagulation. Cashews are known to be brain power boosters. They are rich in iron and zinc. Iron helps to deliver oxygen to all your cells in your body which can prevent anemia and zinc is critical to your body’s immune health and vision. It also helps improve memory and protects the brain against age related memory loss. Diabetics found high amounts of monounsaturated fat for working beneficially for their lipid profile. These nuts aid in reducing triglyceride levels in diabetes patients, that protect them from further cholesterol and sugar related problems. Cashews if incorporated in your diet can significantly lower the risk of developing diabetes type 2. Cashew nuts contain ample amounts of unsaturated fatty acids and mono unsaturated fat (oleic acid) that promote cardiovascular health. Often high triglyceride levels are associated with an increased risk for heart disorders and mono unsaturated fats reduce triglyceride levels. These nuts are rich antioxidants that are essential for eliminating free radicals. Free radicals are harmful to the cells. Damaged cells and free radicals cause some cancer form, thus it is essential to inhibit their growth. Often, cashews are recommended for several diet plans, which are a part of weight reduction programs. These have 0% of cholesterol. As cashews are rich in dietary fiber and energy density, if consumed in moderate amounts they may be satisfying and filling. Cashews have high amounts of copper that aid in energy production and melanin. Melanin is a hair and skin pigment. Copper helps in several physiological processes in body, cross linking of elastin and collagen, development of connective tissue and bone, iron utilization and in the elimination of free radicals, that gives greater flexibility in the blood vessels. And don’t eat too many at once. Because of their high fat content, over consumption of cashew nuts can cause unwanted weight gain in individuals. The oxalates in cashews cal also become concentrated in body fluids, crystallizing and causing health problems in people with preexisting kidney or gallbladder problems. With cashew nuts, moderation is key in reaping the health and flavor benefits of nature’s treat.